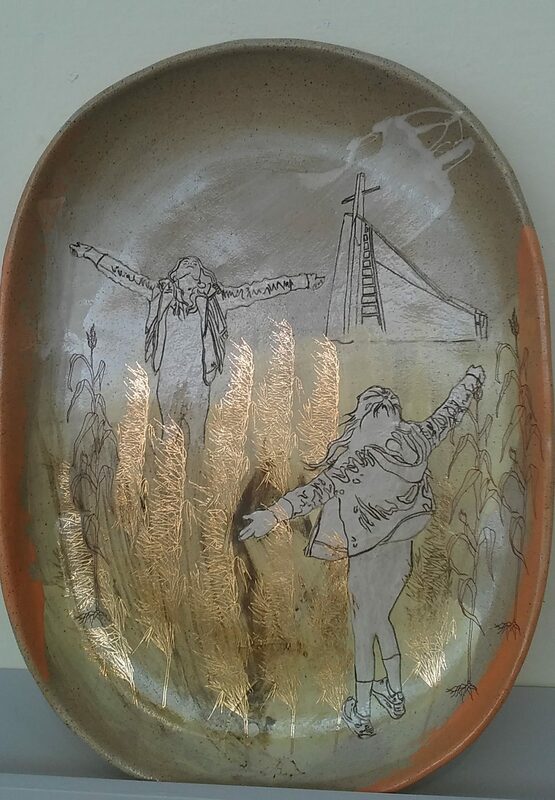 Emilie Taylor’s ceramic pieces don’t only cover “Edgelands” in terms of subject matter, but could be said to exist within one – the edge between art and craft. Vases, pots and plates are uses placed in the second category, one in which concerns about aesthetics run side by side with thinking about function: if it does the job it’s created for. Need proof? Check out my remarkably uncoordinated crockery cupboard. But art these pieces undoubtedly are. Taylor describes herself as an artist with a “socially engaged practice” – a buzz phrase in the art world at the moment, but one which, looking at her work with marginalised groups, rings true. According to the blurb, this exhibition focuses on the young women who came forward in the recent grooming scandals in Rotherham and Rochdale. Serious material, a subject which is frequently sensationalised or used for political point scoring. What these pieces do is try to bring thoughts back to the girls who are ultimately in the middle of the scandal as being young women, rather than only victims. The girls she shows are playing, just like any other girls might. Colour is important: each piece is either a joyful yellow-gold, or else sombre black and greys. Taylor has apparently been inspired by the ancient myths about Persephone , the girl who, married to Hades, divided her year between the worlds below or above, the light and the dark. How do these colours affect how we see the characters? They act the same on either background, and yet also somehow differently. This is particularly observable in one of the most common postures we find the girls in, one which is a little vague. It seems to be a pose calling out to the heavens – but is it with joyful thanks, or desperate pleading? The answer is left ambiguous: on the edge, as it were. In fact, everything about these girls’ lives is ambiguous. There might be a story being told, but it’s not a narrative one – rather it’s a about capturing the feeling of moments. 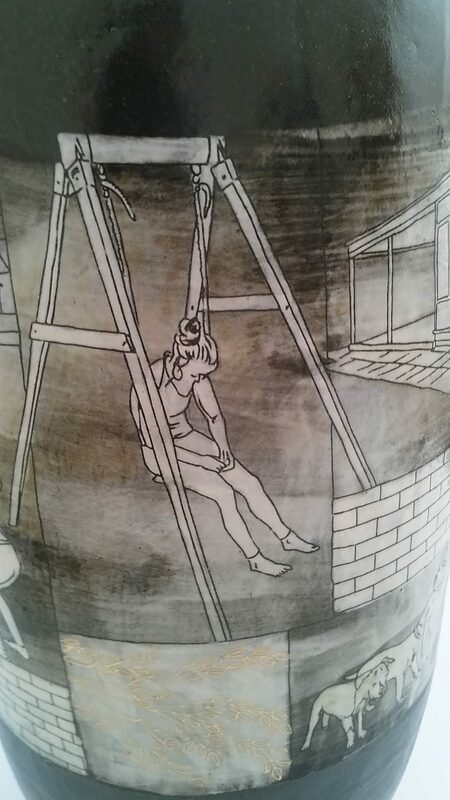 Sgraffito pots are such a wonderful medium for creating these scenes in (sgraffito being a technique of carving a design into a top glaze to bring out the colour underneath). Not only does it make the level of detail really stand out, but it really brings the girls and scenes to life – rather than being flatly painted on, their outlines pop out of the scenes incredibly distinctly. It’s another way of making sure that, rather than simply being a decorative motif, the girls become the story. Being so distinctive, it’s impossible to see the girls as decoration – they are very much the story here. As is their location: this is not a medium in which the council estate fades into a vague background. The blocks of flats stand as objective facts in the background, and could be seen as placing the girls on an edge of social acceptability. I’d actually be interested to find out whether, here or elsewhere on the tour, some people have read the playful running of the girls in a different way because of it. Do they see them as delinquents who are taking time out of their responsibilities? Shame on them if they do: even outside of the grooming-scandal context, happening to live on an estate does not deprive any young person of the right to have fun. Edgelands is gorgeous. From the story, to the medium, to the glorious gold of the sun shining down on the girls as they play. 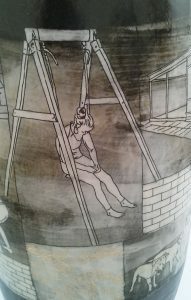 Taking the vase way beyond simply looking pretty, Emilie Taylor has created pieces with a real social conscience. Go and see this not only for the fantastic craftsmanship, but also the way she unleashes the power of her craft. 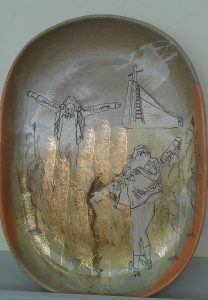 This entry was posted in Exhibitions, Home, Past exhibitions and tagged art, ceramics, Liverpool. Bookmark the permalink.